Blue Sky Adventures participants will stay at the beautiful Marriott Hotel in Colorado Springs! The Marriott is on a bluff with terrific views of Colorado Springs and Pike’s Peak! Scout friendly environment and very safe-no exterior room doors and safe neighborhood. All rooms for the group are ready and pre keyed when you arrive to eliminate check-in delays. Business center with free internet access. Basketball, ping pong, and corn hole! The hotel is located in a nice and safe area in the northwest section of Colorado Springs. There are ample shopping opportunities within 5 miles of the hotel (REI, Target, etc…). 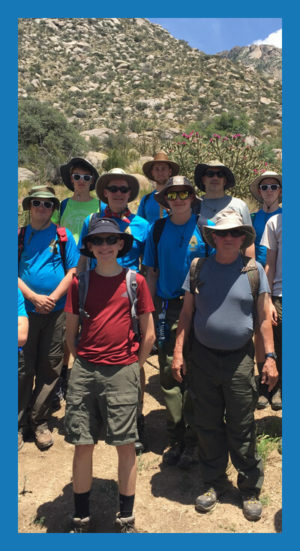 Scout groups are in rooms that are located next to each other so that supervision by advisors is easy and safety and security issues are minimized. A full service restaurant is on site. Breakfast at the Marriott with Blue Sky Adventures is not your run of the mill continental with a limited choice of a few muffins and cereal. Our breakfast is an all-you-can-eat buffet including a variety of fresh fruit, scrambled eggs, bacon, sausage, waffles, assorted cereals, fresh oatmeal, coffee, tea, a selection of fruit juices, yogurts, bagels, toast, danish, muffins, and more!